Seattle has more than 400 parks and open areas within the city limits. That makes it easy to be close to nature here, and you’re never very far from a body of water, whether it’s a lake, a river or an inlet on Puget Sound. 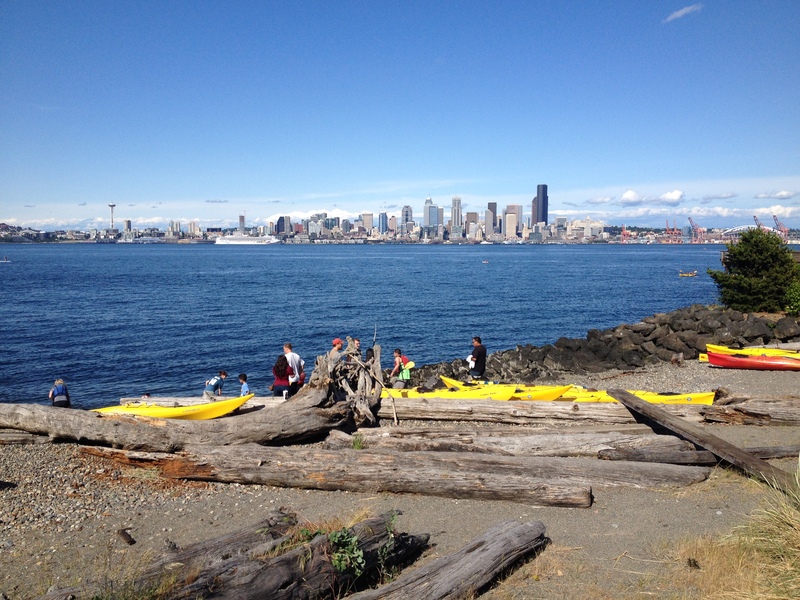 Now that the weather is warming up, Seattle residents are spending more time outdoors, and a lot of them are headed to one of my favorite places – Alki Beach, in West Seattle. “Alki” as the locals call it, feels like a little California beach town that has been transplanted into the Northwest. It sits on Elliot Bay, directly across the water from Seattle’s busy downtown. The 2.5 mile promenade that lines the beach is great for riding your bike, jogging or going roller blading. It’s also one of the best places in the city to take in the great views that Seattle is known for. Sit back and watch as ferries glide along the water, and the sun sets over the Olympic mountains. If you spend enough time at the beach, you might even catch a glimpse of the river otter family who lives in the neighborhood and can sometimes be spotted crossing the street to get to the water. You can drive your car to Alki Beach, but it’s not recommended, since traffic backs up quickly along the two-lane road lining the beach. It’s a lot more fun to take the West Seattle water taxi , which you can board at Pier 50 on the Seattle waterfront. The ride takes about 20 minutes, fares are just $4.75 each way, and you can bring your bike for free.